Metrobank Swatch Promo ~ Philippine Freebies, Promos, Contests and MORE! Now is the perfect time to apply for a new Metrobank Mastercard. Get qualified, use it anywhere and get up to P3,000 worth of accumulated shopping credits to shop at selected Swatch stores and kiosks nationwide. Choices of Swatch Watch or Swatch Bijoux is up for grabs. 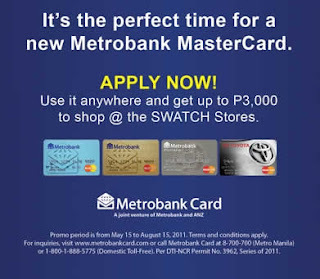 Simply present your new Metrobank MasterCard and the original Perfect Time Shopping Credit advice indicating the amount to be redeemed to the Swatch store cashier for you to redeem your watch. Newly approved and qualified principal Metrobank MasterCard cardholders who have applied and completed the requirements within the promo period. Personalized Perfect Time Shopping Credit advice with a minimum of P1,000 or up to P3,000 worth of accumulated shopping credit. Once presented for redemption, each Perfect Time Shopping Credit advice must be redeemed in full. Any unused balance will be forfeited. Every P10,000 valid spend is equivalent to P1,000 worth of Perfect Time Shopping Credits. Accumulation of valid spend includes all retail purchase and merchant installment transactions, inclusive of domestic, international, and online transactions. For merchant installment transactions, only principal amount of transactions booked within the spend period will be counted. Perfect Time Shopping Credits awarded to the same principal cardholder maybe combined to redeem an item. However, he/she cannot combine it with another principal cardholder.